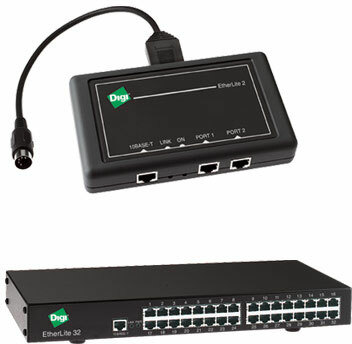 The EtherLite family blends the control and performance of asynchronous serial communications with the convenience of an Ethernet connection. Available in two- to 32-port versions, the traffic from all serial ports is serviced by a single TCP/IP session. The EtherLite network serial concentrator connects asynchronous serial ports to your network. It replaces the installation of serial adapters in servers for applications in retail/POS, process control, data collection and console management of clusters, routers, hubs, switches, PBXs and other networking devices with console ports.